And you can quote me: "Here is how to stop lotion from developing that plug of dried lotion in the tip of a pump dispenser bottle. I mean, what's the point of the convenience of a pump bottle if the pump gets clogged with that plug of dried lotion, right?? 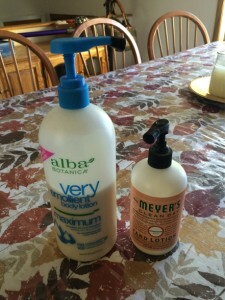 Some day somebody is going to invent a clog-free pump, but until then, here is how to keep lotion from drying out and clogging up the pump with that annoying plug of lotion." Here is how to stop lotion from developing that plug of dried lotion in the tip of a pump dispenser bottle. I mean, what’s the point of the convenience of a pump bottle if the pump gets clogged with that plug of dried lotion, right?? 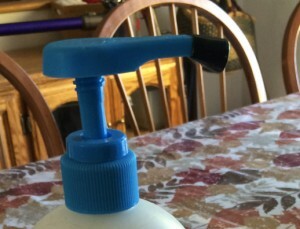 Some day somebody is going to invent a clog-free pump, but until then, here is how to keep lotion from drying out and clogging up the pump with that annoying plug of lotion. 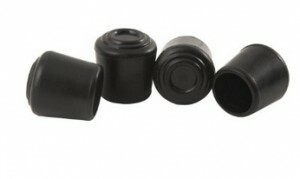 The secret is to get a package of rubber chair tips (I use 3/4 inch tips) which you can pick up at any hardware store for a few dollars. You just slip one over the tip of the pump, and your lotion stays nice and..er.. lotiony. No more dried-up lotion plugs! What a great idea. Thx.